Daniel Island is located 25 minutes northeast of the Charleston Peninsula. Development on the island didn't start until the mid to late 1990s, making it the newest community in Charleston. Daniel Island has been planned so that houses, condos, and townhomes are intertwined with commercial spaces, giving the effect of small town living in a safe and secluded suburb of Charleston. The downtown section of Daniel Island is centrally located among the neighborhoods and is within walking distance of many of the houses. You'll find shopping and restaurants, medical offices, churches, and banks in this growing commercial section. Many of Daniel Island's condos are also located here, making them ideal for condo buyers wanting to live in a newer and more modern urban environment. For movie theaters and a larger selection of shops and restaurants, Daniel Island residents can drive 10 minutes to Mt. Pleasant or 25 minutes to downtown Charleston. Known for its exclusive club membership and amenities, Daniel Island is one of the most desirable areas of Charleston to live. The club boasts nationally ranked golf courses designed by Tom Fazio and Rees Jones, a beautiful club house with a ballroom that is often used for weddings and other events, 2 salt water pools, a state of the art fitness center, croquet and bocce lawns, and an impressive tennis center which has the only grass court in Charleston. If you're looking for unparalleled amenities in a country club setting, Daniel Island should be at the top of your list for areas to consider. Daniel Island is one of the nicest communities in Charleston, and it's earned many accolades in the short time since it was developed. In 2007, it received the Urban Land Institute's prestigious Award for Excellence as a national model for smart growth. In 2006, Travel + Leisure Golf ranked Daniel Island in America's Top 100 Golf Communities. GolfCourseHome named it in their Best of the Best list for 2008, 2009, and 2010 and also recognized it as a Green Golf Community in 2008. In 2005 and 2007, Where to Retire magazine ranked it in America's 100 Best Master Planned Communities. Daniel Island has also earned status as a Certified Audubon Cooperative Sanctuary. Removed from Peninsular Charleston by a 25 minute drive, Daniel Island is ideal for home buyers looking for an upscale suburb with a country club feel and fantastic amenities. 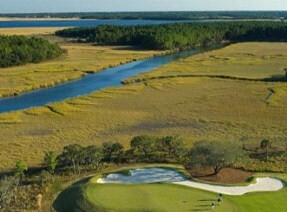 Designed by Tom Fazio, the Beresford Creek Course offers incredible views of the marshes and creeks surrounding Daniel Island. When the course was opened in 2000, it was ranked by Golfweek magazine as a top real estate course in the country. Fazio himself commented that the Beresford Creek Course stands out among all of the courses he's created, "partly because of the width and placement of the holes, the massive trees, the open marshes along the fairways - and the position of the holes along expansive corridors of land." The Ralston Creek Course designed by Rees Jones also boasts great marsh and creek views. When asked about the layout of the course, Jones remarked that it "has all the elements of a stern test of golf, including strategically placed, sculpted fairway bunkers, diversely contoured greens, greenside bunkers placed to protect the championship pin positions, and enough length for the long hitters". Since it was opened in 2006, the Ralston Creek Course has been named among the Top Ten Best New Private Courses in the US by Golf Digest. 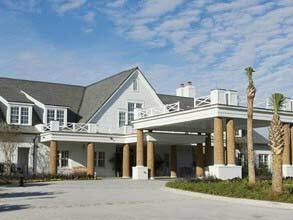 Surrounded by marsh and golf courses, the Daniel Island club house is an ideal setting for hosting a large party or simply dining with family. The Grill Room offers casual dining with indoor and outdoor seating. It also overlooks the Ralston Creek Golf Course and marsh. The more formal Dining Room is open for dinner on Thursdays through Saturdays and specializes in Lowcountry cuisine. The Pub offers a smaller, more intimate setting for cocktails and tapas. The Ballroom at the club house is a popular place for wedding receptions and other large parties. It can seat 300 guests for a dinner or 500 guests for a reception. It's fully equipped with audio visual equipment and has an adjoining gallery and bar. Inside the club house, you'll also find a golf shop and a private board room. The front lawn of the club house is designated for croquet, and a bocce lawn is maintained behind the club house. 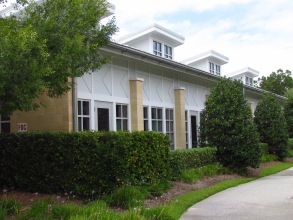 The Tennis Pavilion has 11 courts total - 8 Har-Tru courts, 2 hard courts, and 1 grass court (the only one in Charleston). The Pavilion offers a pro shop just for tennis apparel as well as teams and leagues to play with. Tennis pros teach at programs and clinics for every age and ability. You'll even find a state of the art video analysis to improve your performance. Charleston's professional soccer team, The Battery, has its home stadium on Daniel Island. When Blackbaud Stadium was built in 1999, it was the first privately funded soccer stadium in the country. The Charleston Battery's season schedule usually runs from March through August, and the stadium often has a fireworks show for the kids after weekend night games. In the summers, it also hosts soccer camps for kids aged 5-13. 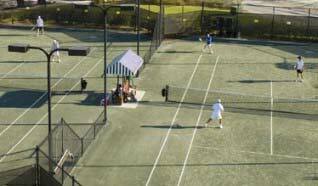 Daniel Island is also home to the Family Circle Tennis Center, which hosts the Family Circle Cup every April. With a history of more than 35 years, the Family Circle Cup is the longest running professional tennis event for women. The tournament attracts the best athletes from around the world, including Shahar Peer, Maria Sharapova, Samantha Stosur, Jelena Jankovic, Caroline Wozniacki, Venus Williams, and Serena Williams. The Family Circle Cup is one of the biggest annual events in Charleston, totaling just under 100,000 visitors each year. The stadium also hosts concerts and other performances throughout the year. Daniel Island Academy is the main day care center, serving children from preschool (1 year old) through kindergarten (6 years old). It gives full day as well as half day options and enrolls about 300 kids. Daniel Island is zoned for some of the better public schools in the Berkeley County School District, but these usually don't rank as well as the public schools in Mt. Pleasant or James Island. You'll find that most Daniel Island residents attend private schools. 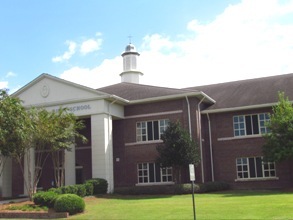 One of the top private schools in Charleston, Bishop England High School is located on Seven Farms Drive on Daniel Island. This Catholic co-ed school was founded in 1915 and enrolls about 900 students each year. The Battling Bishops athletic program offers sailing, golf, lacrosse, ice hockey, wrestling, and swimming in addition to the usual sports like football and soccer that you'd expect to find at any high school. Daniel Island real estate fetches some of the highest prices in Charleston, with current values reaching almost $7 million. 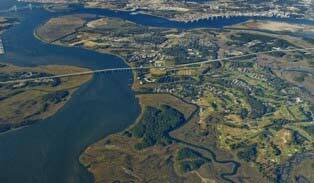 Ideally situated between the Cooper and Wando Rivers, Daniel Island offers a large selection of deep water homes. The island is also laced with marshes and tidal creeks which provide the privacy and views that many home buyers desire in prices that are more affordable for waterfront real estate. You'll find 8 neighborhoods surrounding downtown Daniel Island. Barfield Park is made up of houses and townhouses and has some of the most affordable options on the island. Center Park also has houses and townhouses, but prices are more in line with what you'd expect to pay on Daniel Island. Cochran Park has only houses, many of which are marshfront. Codner's Ferry Park was one of the earliest neighborhoods developed on Daniel Island, and it has houses only (some of which are marshfront). Daniel Island Park is the most sought after neighborhood because it has the Daniel Island Club within its borders. It offers condos, townhouses, and houses, and you'll find that many of these overlook the marsh and golf courses. Etiwan Park has some of the most affordable houses on Daniel Island. Pierce Park features houses and townhouses, and it has its own pool. 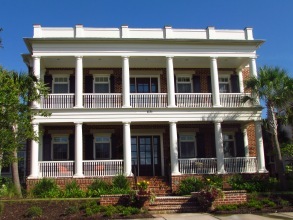 Smythe Park is the newest neighborhood on Daniel Island, and it's made up of houses and condos. Used for the greater part of the 20th century as a cattle ranch, farming community, or private hunting resort, ownership of this sea island was last privately held by the Guggenheim Foundation. The Foundation sold its ownership interest after the property was annexed by Charleston in the early 1990s, with development and municipal services following soon after. Today, the 4,000 acre island situated between the Wando and Cooper Rivers is an upscale community that marks the fusion of residential and commercial interests. Daniel Island also emphasizes the importance of conservation and green space - an effort that can be appreciated when walking through the hundreds of acres of parks, 12 miles of leisure trails, and over 20 miles of rivers, creeks, and marsh. Housing on the island is an eclectic mix of single family houses, townhouses, and condominiums in a diverse array of neighborhoods. While real estate on Daniel Island is more expensive than similarly situated homes in West Ashley, Mt. Pleasant, or North Charleston, prices are still less than homes located on Kiawah, Seabrook, or the Peninsula. The mixed-use zoning that is the hallmark of Daniel Island also serves to create a small town atmosphere. Walking and biking are major forms of transportation on the island, and many of the shops, restaurants, schools, and churches are within a short distance of the homes. Interstate 526 connects the island to easy, large-scale commercial access in North Charleston or Mount Pleasant.